This is the tenth in a series of articles that cover a number of variations on classical yoga practices in the hopes of supporting teachers in finding safe and beneficial ways for all students to participate. The ultimate question for the yoga practitioner is, “Who am I?” Am I the body, which will get old and die? Am I the mind, which seems like a constant jumble of thoughts and emotions? Is there a deeper awareness beyond the body and mind? Perhaps that is the awareness that allows one to step back from the thoughts and observe them? Could this awareness be who I really am? Through yoga practice we make an effort to disconnect from our thoughts so as to reveal that pure awareness beyond thought. It’s ironic that the word yoga is so often translated as “union,” when really it’s about this separation—a discriminative discernment that allows the truth of who we are to be revealed. A clarity that lifts us above the clouds of the mind to a place where the sun is always shining. Practicing asana creates space in the body for this expansive experience. Pranayama (breathing practice) soothes the nervous system, and in turn, the thoughts that are the ghostly reflection of those firing nerves. And pratyahara (sense withdrawal), a practice that often gets short shrift, helps to keep thought-triggering external stimuli at bay. Pratyahara is how meditation begins: We withdraw from our senses by sitting still, dimming the lights, turning off the phone, closing our eyes, and looking within. As yoga teachers, we often look to other traditions to inspire us—like mindfulness meditation, which comes from the Buddhist tradition. But it can be useful to reflect on the way that meditation is traditionally taught in the yoga tradition: to focus the mind on one thing. Beginning meditators often feel frustrated because their minds are so busy. This is the universal experience of the mind; it’s constantly jumping from thought to thought, frantically looking for ways to achieve happiness through the satisfaction of its desires. Paradoxically, the mind’s belief that happiness comes from outside is incorrect. According to the yoga teachings, happiness and peace are the nature of this inner awareness. By creating space and by calming the nervous system, we can turn inward and allow the mind to reflect this pure awareness. 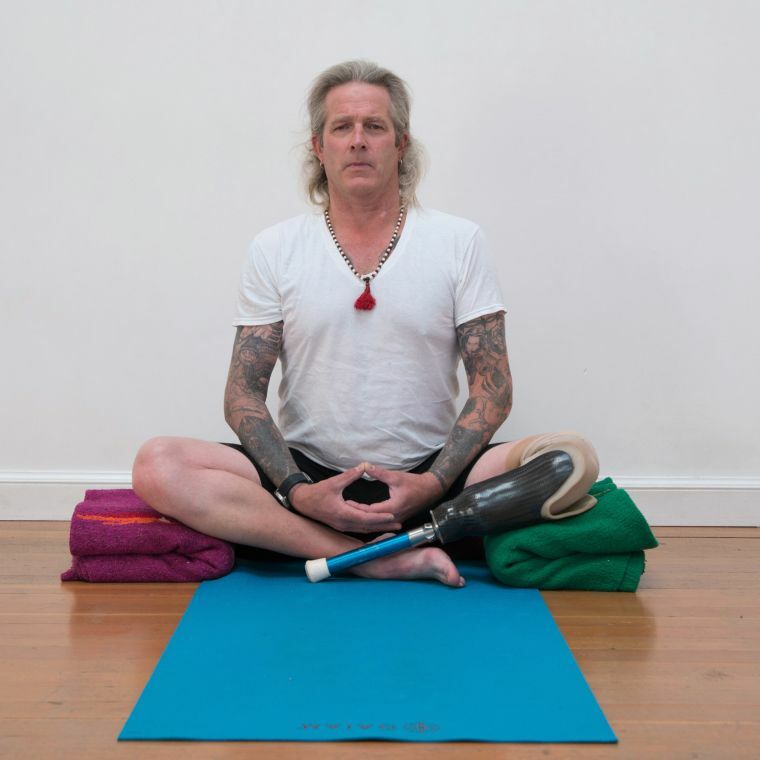 Sitting in a traditional meditation posture, such as padmasana (lotus pose), may not be accessible for many people, therefore props can be essential for sitting for any period of time—for example, sitting on a meditation cushion with blocks or blankets under the knees, or using a meditation bench. My favorite way to use props when sitting on the floor in a cross-legged position is to roll a blanket into a long, thin roll and place it between the knees and ankles. Also, students can practice meditation while sitting in a chair, if possible, sitting forward in the chair with feet firmly planted on the floor (ankles directly below knees). If it’s more comfortable, the student can sit all the way back in the seat of the chair and lean against the back of the chair. 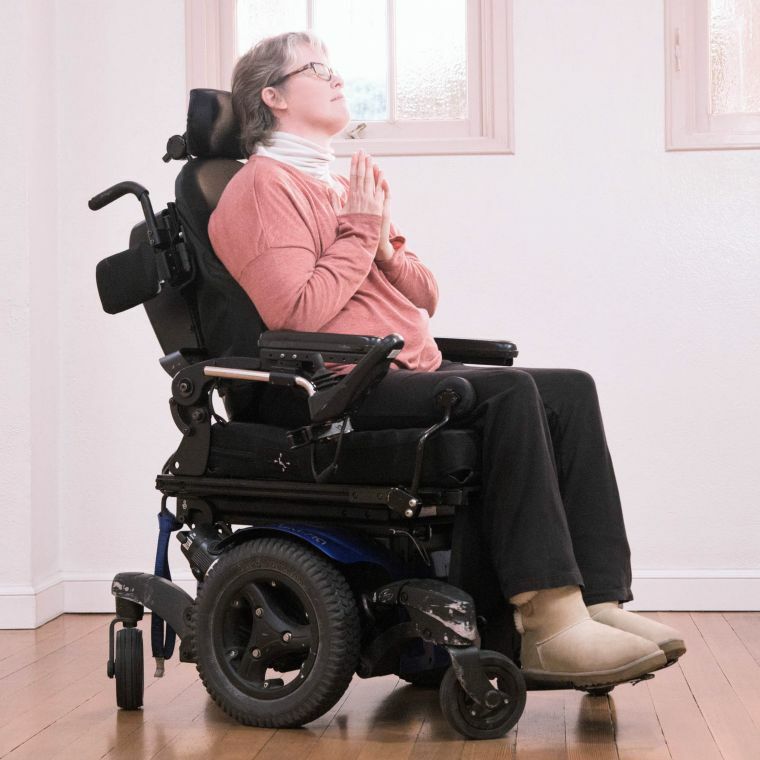 A student practicing in a wheelchair might place a loosely rolled yoga mat vertically behind their spine to support their posture. The most important thing is that the body is comfortable, and sitting upright helps students stay awake and alert during practice. Saying that your mind is too busy to meditate is like saying that you’re too dirty to take a bath. We all have busy minds that can benefit from some form of meditation; however, silent, seated meditation may not be right for everyone. 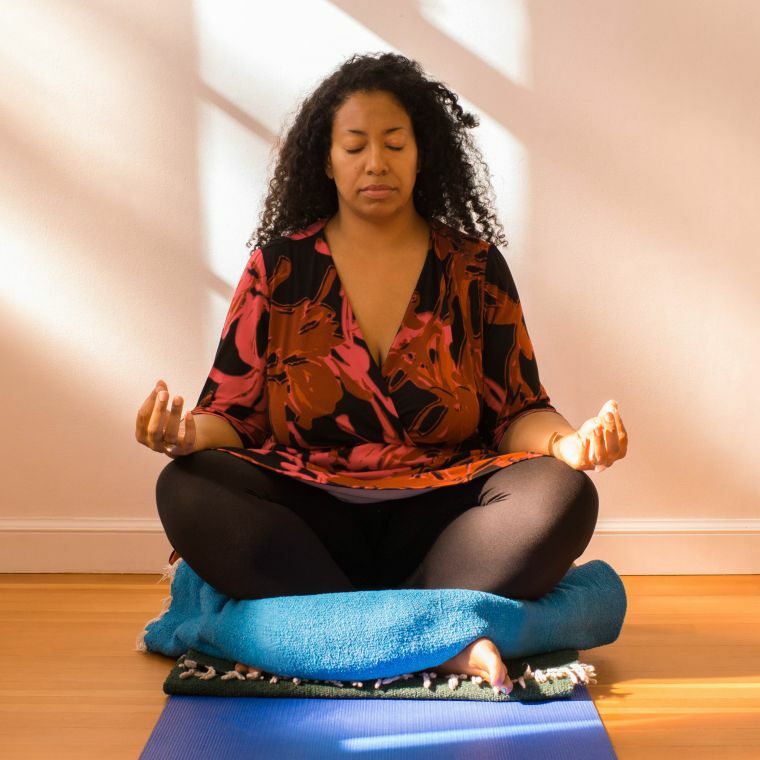 For some, silent meditation may be triggering because it releases stored emotions or trauma, which they might not be prepared to acknowledge or confront on their own. If this is the case, it’s better to focus on grounding and embodied practices like asana, or experiment with more active forms like walking meditation or yoga nidra (guided relaxation). There are many ways to approach the mind, and it’s helpful to explore different techniques to discover which one is the most comfortable and accessible. The key is to understand the underlying purpose of meditation, rather than to focus too narrowly on a specific form. It’s important to find ways to teach that are inclusive and motivating, rather than teaching in a way that might feel limiting or exclusive, or force a student to rely too heavily on you as the teacher. For example, when teaching meditation, it’s important to respect the students’ background and experience. For students uncomfortable with a Sanskrit mantra, you might offer a neutral practice, like a breath meditation, or encourage them to explore their own spiritual beliefs in order to find a practice that works for them. You could encourage them to find sacred words connected to their religious background, such as amen, shalom, or salaam. The most universal focus for meditation is the breath itself. The breath is always there, and most importantly, the breath is always in the present moment—you can’t breathe in the past or the future. By focusing on the breath, the mind is brought into the present, which is the only time we can actually feel happiness and peace. You can observe the physical sensations of breathing, or focus on the energetic experience of the breath moving up and down the spine, or focus on the feeling of the whole body expanding on the inhale and contracting on the exhale. Mantras are sound vibrations designed to focus and literally protect the mind (man=mind; tra=protect). There are certain “seed” sounds (bija mantras) that are particularly powerful, but all mantras are essentially equal, and they are all aspects of the universal hum, om. A student with a devotional nature may want to explore the relationships between Hindu deities and their related mantras. Or, they can focus on a universal mantra such as om shanti (om=universal vibration; shanti=peace), or om namah shivaya (salutation to Shiva, the destroyer). Using a mantra requires patience. Explain to your students that each time the mind wanders to another thought, they can gently bring it back to the mantra without criticism or frustration. Sometimes a combination of focusing and relaxing is most effective. After a few moments of focusing on a mantra, it may be helpful to spend a moment relaxing the mind, consciously let go of the thoughts, and then come back to the mantra again. Once the mind is quiet, you can experience the state of meditation, which is also known as “being in the flow”—a place of timelessness and spaciousness also experienced by athletes, artists, and musicians. In fact, this flow state is a natural state that we seek out. And while it can occur during other activities, yoga is specifically designed to cultivate this experience. Students who are more visually inclined can use a candle flame, a flower, a picture of a deity, or a yantra (mandala), among other objects, as their focus. The student can concentrate on the object for a brief period, and then, if they feel comfortable doing so, close their eyes and picture the object in their mind. For example, when focusing on a light, the student can also feel that the light is reflected within themselves. Visual meditation can be particularly useful for students who have experienced trauma or who don’t feel comfortable closing their eyes. It’s also useful for deaf students, and it can be combined with the breath or mantra for anyone who needs extra support. Another form of meditation (mentioned above) is yoga nidra, literally “yogic sleep.” Yoga nidra is sometimes simply referred to as savasana, but in truth, savasana (or “corpse pose”) refers to the physical posture (lying on one’s back), and yoga nidra is a guided meditation that is practiced in that posture. 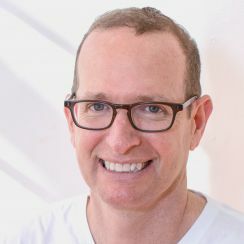 It is a progressive relaxation technique that is also a journey through the layers of our being called koshas (sheaths or bodies). There are five layers, or koshas, collectively known as pancamayakosha (panca=five; maya=illusion; kosha=sheath), which constitute our human embodiment, and move from gross to subtle. Contemporary science talks about the mind-body connection, and researchers have been busy for decades trying to prove that it exists. But in yoga, the mind-body connection has long been the foundation upon which all the practices function. In fact, ancient yogis would probably laugh at the idea of trying to prove the mind-body connection! The kosha model is based on the idea of integrated wholeness. This means that thoughts affect our energy, which in turn affect our physical body. There is no separateness. Additionally, the subtler layers are actually more influential than the gross ones. So, in this model, thoughts and emotions have tremendous influence over the body. This is important to understand about yoga practice in general—more subtle is more powerful. Yoga nidra is a journey through the pancamayakosha. You begin by tensing and releasing each part of the body. If your students have neurological disorders, it may be helpful to focus on stretching and releasing each part, without tensing. Then mentally scan the body while being still. Generally, move your awareness from the feet up, and from outer to inner. Notice what happens when you bring your awareness to a part of the body. Can you feel more energy there? 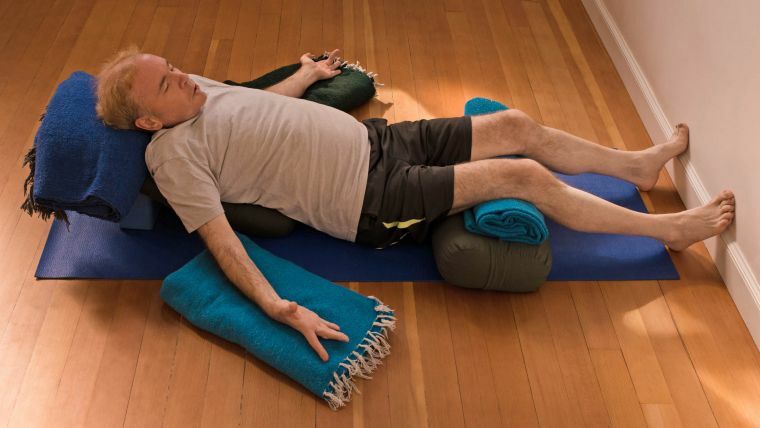 Traditional savasana may not be accessible to all students, either because they are practicing in a chair, or because lying completely flat on the floor is uncomfortable or not possible for them. Yoga nidra can be done while sitting in a chair, but make sure the student won’t fall out of the chair if they fall asleep! Place a bolster or blanket behind the student’s back and have them lean into it so they are gently reclined in the chair. Feet can be raised on a bolster or folded blanket or on a second chair facing them. Also, be sure that their neck is well supported during the relaxation. You can roll a blanket and wrap it around the neck like a scarf to support the head like a neck pillow. If a student is practicing on the floor, they can place a blanket under their head so their forehead and chin are level or the forehead is slightly higher, as well as a bolster under their knees to lengthen their lower back, which can make the pose more comfortable. Covering them with a blanket may help keep the body warm and also provide a sense of protection for a student as they try to deeply relax in a public class. If a student needs more support, they can lean against a bolster propped at an angle by a block under the higher side. A blanket under the head and under each arm provides additional support, as does a bolster under the knees. Meditation is the ultimate practice of yoga, the one where we get to work directly with the mind. Although it can feel challenging, there is tremendous benefit to practicing, whether or not we achieve a peaceful state. Learning to focus, consciously relax, and simply make friends with the mind is a huge achievement for any of us and is one of the most useful rewards of a yoga practice.